Thanks to the support of our generous sponsors and donors, and to the hard work and dedication of our amazing volunteers, friends, board members, and staff; we were able to raise an unprecedented amount of funds that go a long way toward feeding the hungry in Muncie for another year. We are finalizing our income and expenses, but have exceeded our budget set for the dinner of $61000. Just like running the Soup Kitchen year after year, we could not have put on this year’s dinner without a great team of support on our side. A BIG THANK YOU to Ed Shirey and his daughters who kept the auction lively and fun. We were able to auction Dan Woodson’s painting “Behind the Barn” for over $5000. This is the largest amount we have ever received for a painting. The two “Heads and Tails” cakes brought in $735 together. A good way to get everyone involved for a GREAT cause. All items on the silent auction table were donated by individuals and business in the community. Thanks to Jessica Shrout, Lois Altman and Shannon Henry for their hard work in securing these items. 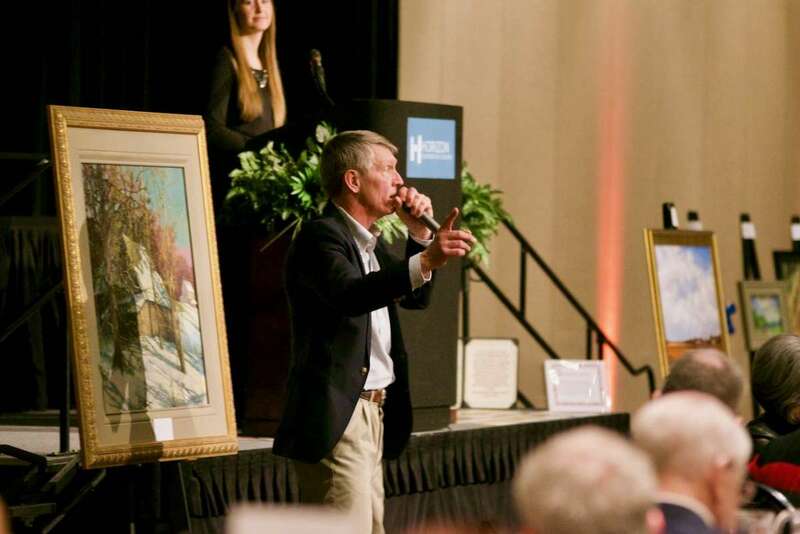 A big thank you to Bill Elliott, business advisor, who along with Lois Altman, and our board , secured sponsorships, and items for the live auction. We were so pleased to be able to celebrate our 25th anniversary with nearly 400 guests this year, in our new venue at the Horizon Convention Center. Not only did the larger space provide room for a larger celebration, the hard work the Horizon team put in allowed us to concentrate on showing our guests a great time and thanking the community for their support over the years. And of course, we are ever grateful for our sponsor and donors. We were blown away by the number of local businesses and people who wanted to be a special part of the dinner this year, and who were willing to step up their support. The Event sponsor Patton and Erie Insurance ; now Wolfe-Rich-Patton United. Mari Patton as has been a long time supporter of the Soup Kitchen and we appreciate her and her associates for the continued support. We want to thank all our guests who purchased tickets to attend. Maybe you filled a table or you bought a ticket. We appreciate your support, everything counts in helping us feed the hungry. We look forward to another year of serving this community and celebrating our achievements again next year!